Chief city of eastern Flanders, Belgium. That at the time of the Crusades there were Jews in Ghent is known, as they were the victims of pillage and massacre. In 1125 the Jews were expelled from Flanders by Charles I. "the Good," Count of Flanders, who attributed to them the great famine which afflicted his domains in that year. The exclusion of Jews was not of long duration, for in the thirteenth century a community in a flourishing condition is found at Ghent. After the establishment of the Inquisition in Portugal in 1531 many Maranos are said to have taken refuge in the Low Countries, but they were driven out by a decree dated July 17, 1549. In 1724 the judicial authorities of Ghent issued a decree regulating the form of the Jewish oath. In 1756 Charles, Duke of Lorraine, issued to the magistracy of Ghent, as well as to the chief cities of Belgium, a decree imposing upon the Jews an annual poll-tax of 300 florins for the benefit of the empress Maria Theresa. This tax was so exorbitant that its payment could not be enforced. During the reign of Joseph II. (1780-90) the Jewish community of Ghent was given for use as a cemetery a parcel of land, about eight yards by seven, which lay close to the Antwerp gate. Here was found a tombstone bearing the date 27th of Adar, 5546 (March 27, 1786). 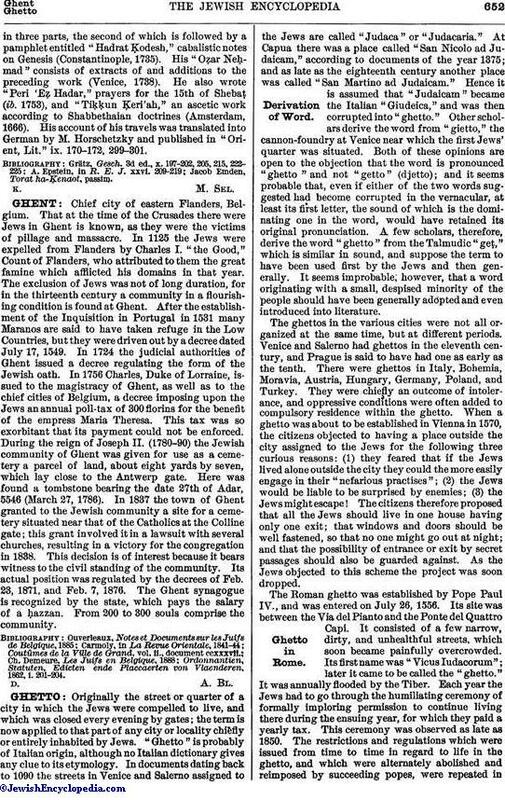 In 1837 the town of Ghent granted to the Jewish community a site for a cemetery situated near that of the Catholics at the Colline gate; this grant involved it in a lawsuit with several churches, resulting in a victory for the congregation in 1838. This decision is of interest because it bears witness to the civil standing of the community. Its actual position was regulated by the decrees of Feb. 23, 1871, and Feb. 7, 1876. The Ghent synagogue is recognized by the state, which pays the salary of a ḥazzan. From 200 to 300 souls comprise the community. Ordonnantien, Statuten, Edicten ende Placcaerten von Vlaenderen, 1862, i. 201-204.